Over the course of his public life, Jay hasn't always shown himself to be a supreme athlete. While Roc Nation Sports, the sports management arm of his company, deals with some of the greatest and richest athletes on the planet, Jay usually finds himself at the centre of a meme when he showcases his athletic abilities on camera. But is this fair? Is Jay actually much better at sports than we're giving him credit for? After collaborating with Frank Ocean on the track "Biking", a song that uses riding a bicycle as an extended metaphor for karma in the music industry, there is no better time to explore whether Jay is an underrated sportsman, or just human, like the rest of us. My uncle had promised to put training wheels on the second bike I’d received from my cousin, but he hadn’t gotten around to it. Me being the younger of four kids, I was determined to be independent and not spoiled... I took the bike outside, and from 10 a.m. to 5pm. taught myself how to ride without training wheels. He told Oprah in 2009 that as a child he was "famous" because he was the five-year-old who could ride a 10-speed bike, and on "Best Of Me (Part 2)" he claimed to be doing wheelies by age six. I don't want people to think they could test me on the street... Everything I do, I've mastered... Two more years Imma be fighting Roy Jones." We go to the gym, this one's closed doors, throw on some headgear, three rounds. Quick. There have been multiple lyrical references to Jay's ability to throw hands as well. On 2001's "Renegade" he offered "Do not step to me, I'm awkward / I box lefty". On 2003's "Moment of Clarity" he rapped "What, you gonna box me, homie? I can dodge a jab", and on 2002's "Show You How" he challenged "You can't fight me, in the Porsche I'll box you out." There's no footage of Jay actually boxing, but we can ascertain from his lyrics and interviews he probably fancies himself in the ring. He's been associated with the sport as both a fan and manager on multiple occasions, with boxing references and metaphors littering his rhymes, and pictures of him with legendary scrappers all over the internet. My big brother Eric played basketball in junior and summer leagues and was a straight star. When we first moved to Marcy my father set up a little basketball hoop in our apartment -- and we would all sweat it out right there in the living room like it was Madison Square Garden. His ties to the sport are incredibly deep. Back in 2003 Jay took on the famous Rucker Park street ball competition, amassing a team of local legends and ringers that eventually lost to Fat Joe's Terror Squad team (it's a long story, but a freak blackout in the city forced the game to be played the next day, and by then, Jay was on a private plane jetting off on a holiday). While he didn't play in the competition himself, Reebok still decided to award him his own signature basketball shoe in April 2003. At the time, it was the fastest selling shoe in the company's history. He was also an unlockable character in NBA Live 07. 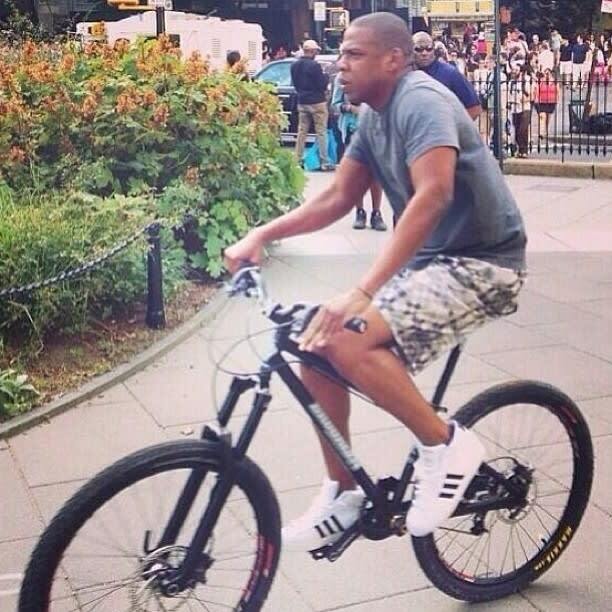 This is one sport Jigga is not too good at. Although, in his defence, he was taking on one of the greatest athletes of all time. 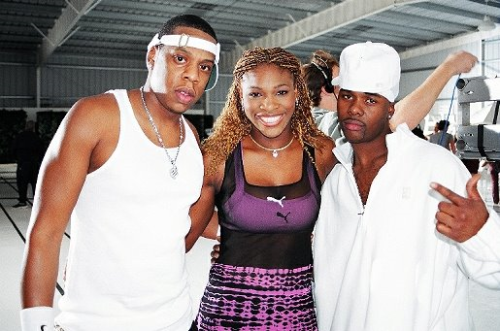 During the video for Memphis Bleek's single "Do My", Jay, Bleek and Serena Williams engage in a game of Tennis. While Jay is shown actually returning one of her serves, this may not be an accurate depiction of what transpired. In an interview with 106 & Park Serena said: "Bleek was good, he was actually hitting my balls! But Jay wasn't that good..."
Another sport that Roc Nation Management has on lock, with multiple high-profile athletes on the roster. 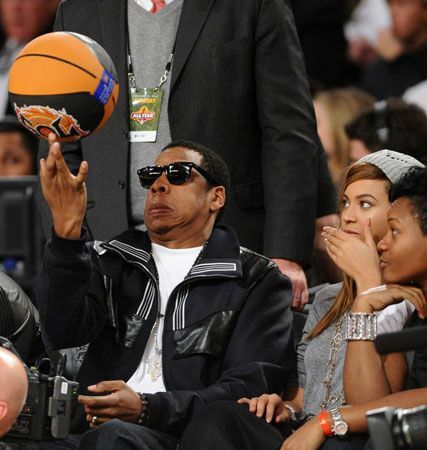 Unfortunately, Jay's physical association with the sport has boiled down to a meme of him looking awkward throwing a football. I'm sure if someone analysed every still frame of me playing a random sport they'd find something awkward as well. Hopefully, the footage of Jay playing football with daughter Blue Ivy that aired during Beyonce's LEMONADE visual album will usurp this meme. Swimming / Diving - People love to knock a legend don't they? In 2013 the internet exploded with memery after Jay was photographed awkwardly diving into a pool next to Beyoncé. The fact he was next to his famous, beautiful, talented and rich wife on a family holiday in Italy at the time doesn't seem to matter. Motorsport - The video for Jay's 2006 comeback single, "Show Me What You Got", was dripping in expense and luxury. In the opening scene, Jay (riding shotgun to NASCAR ace Dale Earnhardt Jr in a Ferrari F430 Spider) challenges stock car legend Danica Patrick, who is in a Pagani Zonda, to a motor race through Monaco. Jay then takes the wheel of a speedboat as he engages in another high speed race. Running - Despite claiming "I just run the town, I don't do too much jogging" on Drake's 2010 track "Light Up", Jay told an interviewer in 2010 that he had run a mile that very morning: "I got up around 8, had some breakfast, went and ran a mile, it was really tough... You know, I just wanted to touch it, a little bit." During the track "Lyrical Exercise" he often references running but uses it as an extended metaphor for the way he trains and hones his skills as a rapper. Golf - Hov has a mean backswing. Check him out during Memphis Bleek's "Do My" video launching one into the city. Push-ups / General - In 2003 he was pictured with his then-personal trainer Gregg Miele. In a Rolling Stone feature from 2005 it was revealed he had a gym at his house in New Jersey, and had used it the morning of the interview. He was pictured with exercise physiologist Marco Borges in 2016 at a basketball game. He was pictured backstage in 2006 doing push-ups to "stay fresh". A beautiful home video also exists of Hov doing push-ups with daughter Blue Ivy.